Shanille and her baby boy. Shanille Blase had her first sexual experience at age 13. For the young girl from Purok Old San Isidro village in Davao City, it was a form of teenage rebellion, she recalls. At 17, in her second year of a business course in college, she got pregnant unexpectedly, and her boyfriend left her. Afraid, alone and depressed, she remembers what a difficult situation it was. “I made a big mistake. I was too trusting,” she says. Shanille is not alone. According to the Philippines Statistics Authority (2014), about 24 babies are born every hour in the Philippines to teenage mothers. 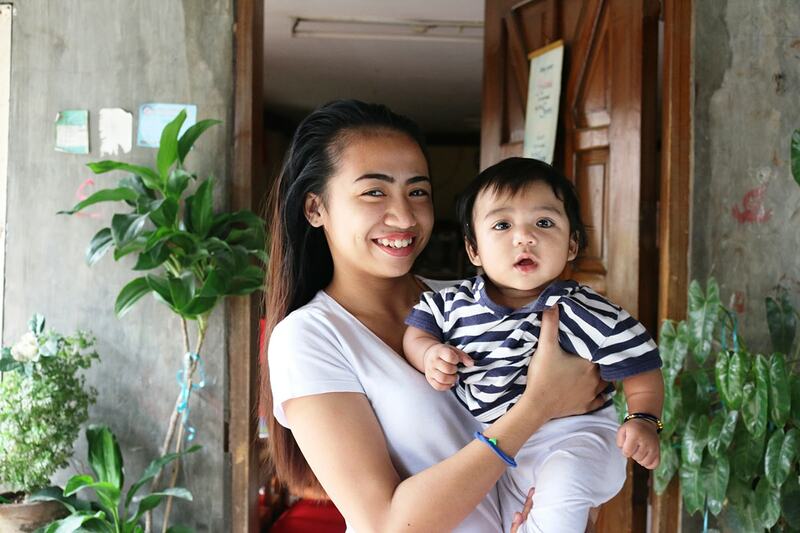 The Davao Region, where Shanille lives, has one of the highest teenage pregnancy rates in the country, at 14.1 percent. Shanille remembers how hard it was to break the news to her family. She was 4 months pregnant when she finally opened up. Thankfully, her family supported her. Her grandmother, a community health worker, was particularly supportive and prodded Shanille to attend an outreach camp near their village, which ran a health program for teens. Shanille went at her grandmother’s urging but didn’t expect much. Brokenshire Memorial Hospital, a private tertiary hospital in Davao City, conducted the program with the support of the Jhpiego-led Mindanao Health Project, which is supported by the United States Agency for International Development. Through its adopt-a-community approach, the hospital partnered with the City Government of Davao to hold weekly community outreach activities at health outposts closer to communities they wanted to reach. There, resident physicians provided medical, perinatal and family planning counseling, as well as other onsite health services. Looking back, Shanille knows she made the right decision to attend the outreach. She met a remarkable team of caring doctors and nurses who provided antenatal care, counseling and guidance on sexual and reproductive health and on family planning. She enrolled in the hospital’s program for teens and began to take advantage of the hospital’s TeenMom package, which provided her with free antenatal checkups, discounted delivery services, postnatal checkups and childcare. Shanille delivered a healthy baby boy at Brokenshire Memorial Hospital. With the family planning counseling she received at the hospital, she chose an implant that would help prevent pregnancies for 2 to 3 years. Today, she uses her own story as an example to advocate for family planning in her community. She visits her peers and other teenage mothers, often alongside her grandmother, and talks about options for delaying pregnancies and taking advantage of adolescent-friendly health services. With continued guidance and care from the hospital’s program for teens and support from her family, Shanille now works in a restaurant. She has also made concrete plans to return to school and earn a college degree. Together with her newborn son, she is taking steps toward a thriving future.